I had a terrific time Thursday night talking to the Friends of Mackenzie Environmental Center in Poynette. What a wonderful group of people. We had a nice time, even though most of my power point presentation disappeared into cyberland somewhere. Gratefully, we were able to enjoy the birds I brought. I neglected to get some photos of the presentation. Perhaps some of the folks will send me a few so I can get them on the blog. Thanks to everyone there. Friends groups are invaluable volunteers for groups like Mackenzie and REGI, and no one knows that or respects their contribution more than I do. It was late when I got home. I was tired, but happy to know such good folks are working for wildlife and the environment in our state. 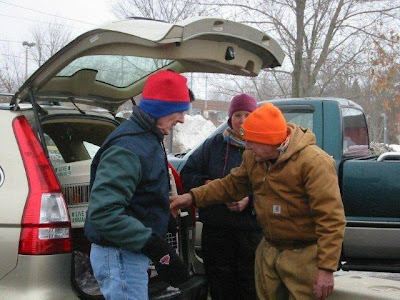 It will take everyone doing their part to make a difference in our world. That is a fact. Friday morning hit with a bang with a call about yet another adult Bald Eagle in a leg-hold trap set for a Coyote. This time it was an illegal trap set in a nearby county. 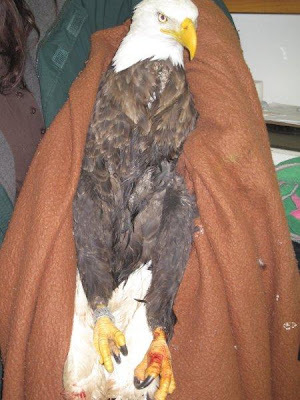 The DNR Wardens and Biologist were called to investigate and found the Bald Eagle caught up in the trap. They were able to get him out of the trap and transported him partway to REGI where I met them and took him the remainder of the way to the clinic. The injuries in the photo look like little "cuts" but reality are crushing injuries that destroy nerves and cause tissue death. This is particularly true in cases where the bird is held in the trap for an extended period. ( traps are not always checked everyday and in some cases are not required to be.) The pressure of the jaw trap cuts off circulation to the leg/foot. In cold country like WI, that lack of circulation makes the leg susceptible to frost bite. Now, you have not only a compression of the tissue and nerves but tissue death from freezing. 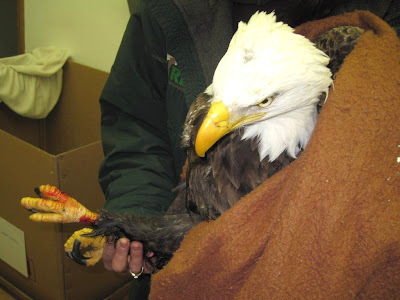 This adult Bald Eagle was banded in the nest. We have already called the band number in to the Bird Banding Laboratory. They will be able to tell us who banded him, where he was banded, and even the date he was banded. The researcher may well know who his parents were, etc. 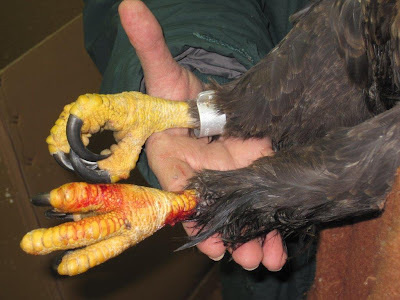 Sadly, with the State of WI cutbacks, the eagle and raptor banding programs were pretty much eliminated ten years ago or more. 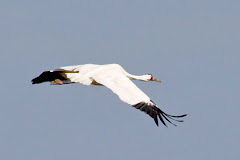 These days, raptor or avian biologists band birds on their own time when possible, but it is no longer part of the state program. We've learned so much about various species including Bald Eagles through the years banding was done. There is still so much to learn. It is a shame the banding was not able to continue. It is one of those programs the public is hardly aware of until it is gone, along with the future data. 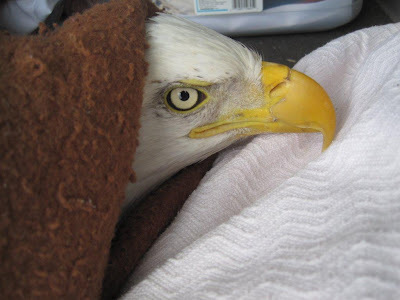 The prognosis is not good for this Bald Eagle. An eagle with one leg cannot survive in the wild because it cannot hunt adequately to feed itself, let alone a family. A heavy-bodied bird like an eagle cannot even live in captivity with only one leg. 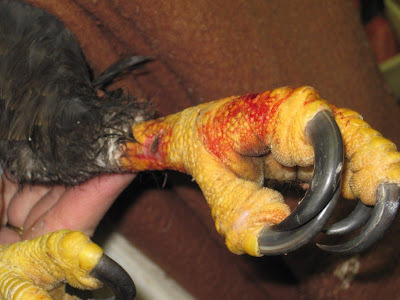 The eagle's entire weight centered on only one foot creates a fatal foot problem called Bumblefoot. We are going to do everything possible, as we always do, for him and hope we beat the odds. I feel like I have to apologize to these magnificent birds that have survived the 60-70% mortality of first-year raptors. Only the best of the best live to become adults and then they are taken in such a horrible manner. We did have some good news yesterday afternoon. The group of seven domestic geese that were dumped on Mill Pond in Medford were all rescued without so much as a ruffled feather, at least on the geese. They were transported to a terrific hobby farm where they can live out their lives with other geese. By all accounts the geese were visibly relieved to see a barn with straw, protection from predators and other geese. Thanks to the group of people that came together to save them. Rosie, the domestic goose encased in ice that came into care at REGI last week, is doing wonderfully. She and our resident gander are happily in love, preening and caressing each other with great vigor. She does have vision loss in the eye near the site where the dog bit her head, but that should not be a problem as long as she lives in a protected environment. More patients keep coming in and I am up to my eyebrows in end-of-year paperwork.